Just as with humans, food is fuel to cats. 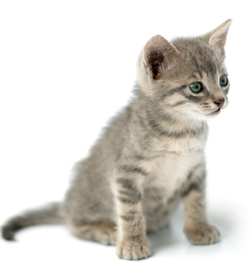 Cats need the proper nutrients to grow, develop, and have energy to play and purr. In addition, taking the time and effort to properly feed your cat can mean an improved quality of life for your cat and prevent many serious medical conditions and expensive trips to the vet. So what nutrients do cats need? Basically, they need four elements: protein from meat, fish, or poultry; taurine, which is an essential amino acid; various vitamins, minerals, enzymes, and fatty acids; and water. Carbohydrates like corn and rice are often added as filler in cat food, but cats do not need them. Preservatives are required to keep food fresh, but manufacturers add other ingredients such as binders, flavoring and coloring to satisfy the human consumer. The essential choice in cat food is that between wet, canned food and dry kibble. Which one is best? Actually, many nutritionists recommend a combination of both. Canned food contains water, which your cat may not get enough of on a regular basis. Dry food, on the other hand, is convenient for a busy pet owner since it can be left out and cats can eat whenever they are hungry. Unlike dogs, cats can regulate their own eating and will stop eating when they get the nutrients their bodies need. In feeding cats both types of food, you can ensure that your cat's dietary needs are met, alleviate food boredom, and prevent possible food allergies or food addictions. You do not need to buy a huge variety of both wet and dry food. Just stocking a few different brands or flavors of each would be sufficient to met your cat's nutritional needs and prevent boredom or addiction. To bring down the costs of being a pet owner, people often buy economy brand cat food. However, this is counterproductive for several reasons. As mentioned above, cats will eat until their nutritional needs are met. Therefore, if you purchase a cheap food with more filler and less nutrients, cats will eat more. If their dietary needs are not met, this may also result in increased veterinary care over a long period of time. When choosing a cat food, study the label very carefully. Ensure that the brand is in compliance with the Association of American Feed Control Official (AAFCO) requirements for "Complete and Balanced" food. To be labeled a complete and balanced cat food, either the food must pass feeding tests for the recommended life stage on the label or food composition needs to meet or exceed AAFCO-established nutrient levels. Also look for a named protein source—"lamb, chicken, or beef" instead of a general "meat" listing. Particularly for canned food, ensure that the protein source is the first ingredient listed and the expiration date has not passed. Some things that you do not want to see on the label are more generic words like "meat and/or bone meal," "animal digest," or added sugars. Chemical preservatives (e.g., BHA, BHT, ethoxyquin, and propyl gallate) should be avoided, as should corn meal filler or an excess of carbohydrate fillers in general. What is excess? Examine many brands, from the highest price to the lowest, and get a feel for an acceptable level. Are Table Scraps Off Limits? In general, pets should never be fed table scraps. Human food interferes with the carefully planned, nutritious diet that you chose for your cat. Feeding your cat at the table can also encourage some very bad habits that are sure to show when the in-laws come over for dinner. However, even the most rule-abiding cat lovers can't resist the urge to share some choice turkey or chicken pieces from time to time. But are there any foods that are always taboo for your feline? Milk: Although not toxic to cats, it can have adverse effects since many cats are actually lactose-intolerant. Some commercial products, made from skim milk with an added enzyme, are a safer alternative. Green tomatoes and raw potatoes: Members of the Solanacae plant family, these foods contain a bitter, poisonous alkaloid that can cause severe lower gastrointestinal symptoms. Onions, garlic, and similar root vegetables: These foods all contain varying amounts of N-propyl disulphide, a substance that causes anemia in cats by killing red blood cells. Grapes and raisins: Currently, studies have shown these fruits are toxic to dogs, and it is believed they may also adversely affect cats. Better safe than sorry! Chocolate: Another food that is toxic to both dogs and cats, the theobromine in chocolate means you can keep it all to yourself and resist sharing it with your feline friend.